A collection of bits and pieces of Internet history. Focusing somewhat (but not exclusively) on: (a) the 1980s, when I first started using the Internet, and: (b) Ireland. My first "Web page" in February 1989. .. or orange on my home computer! This is an adjunct to my page How my program passed the Turing Test where I describe how I hooked up an AI chatbot called "MGonz" to BITNET when I was at UCD in 1989. These pages are a bit of an exercise in nostalgia. They were strange times, on the Net in the '80s. A whole world was happening, but you could never talk about it with anyone. In the '80s, we actually used the word the "Internet" to refer to the machines that used the TCP/IP protocol, which were only some of the machines on what was a vast interconnected network of networks. In retrospect, the whole thing was what we would now call the "Internet". More on this: Some people say BITNET was not the Internet, because it didn't use IP. I think that is just being pedantic. BITNET had people in universities all over the world; it had world-wide email; it had real-time, interactive chat, one-to-one or in "Relay" chatrooms in places like CERN; it had world-wide remote file archives you could grab files from by issuing commands; it had world-wide "Listserv" email discussion lists; you could query if people were logged on across the world; it had disconnected "answering machines"; it had email to and from all other networks. The whole thing (BITNET plus connected networks) was the embryonic Internet. The protocol has simply migrated to IP since, that's all. If BITNET wasn't the Internet, then neither was Arpanet before it switched to IP in 1983. When I was at UCD, you could send talk messages to BITNET nodes (including MGonz) from the TCP/IP machines as well, and when I was working on the TCP/IP machine at UCD, I used to get MGonz to copy me in on any conversation it was having. So even in the pedant's sense, MGonz was on the Internet. In the '80s, this whole world of the embryonic Internet was invisible to the media, and that was just the way things were. When in the '90s the media finally started to cover my world, I was amazed, though I should have known it must happen someday. I finally put up a page about MGonz in early 1995. This adjunct page is a bit more of a description of this "lost world" of the Net before it was "discovered". The European Informatics Network (EIN) project dates from 1971, but was not operational until 1976. The Euronet project is mentioned in at least 1975, but was not operational until 1978 or 1979. The first demonstration connection between Irish universities was in 1977 between UCD (George Morgan, Michael Walsh) and TCD (Ahmed Patel). The first computer network between Irish universities was the IUN (Irish Universities Network) set up in 1979 between UCD (Dennis Jennings) and TCD (Michael Purser, Ahmed Patel). When was the first Irish email? Where is the oldest surviving Irish email? Arpanet switched to IP in 1983. The Irish academic network Heanet dates from 1983. I think this was initially only between institutions in Ireland. One date I am not sure of is when was the first link from Ireland outside the country. By 1981, Michael Purser and Ahmed Patel connected from IUN to Euronet in Europe for performance testing at least (published in 1981), and Michael Purser's group did trial file transfers between Ireland and Denmark "over, I think, Euronet" in the early 1980s. But I am not sure if any of this yet involved a permanent connection to the network outside, with permanent international addresses. EARN (the European section of BITNET) started in 1983. Dennis Jennings brought Ireland to EARN, and became EARN's first President 1983-4. Though the BITEARN NODES file (see below) only has IRLEARN joining in Jan 1985. Dennis Jennings then went to the US to play a major role in the emergence of the worldwide Internet itself. He was Program Director for Networking at the National Science Foundation 1985-6. He was responsible for NSFNET, which became the backbone of the Internet. He was responsible for the decision to use TCP/IP in NSFNET. IRLEARN at UCD was the first Irish node on BITNET (linked to the US and Europe) in Jan 1985, as shown in the BITEARN NODES file. See Irish nodes on BITNET 1985 to 1996 from that file. Kieran Carrick thought that IRLEARN was the first permanent connection outside Ireland, but also thought it was older than the BITEARN NODES file says (though it cannot be older than 1983, when EARN started). So Ireland was certainly on the "Internet" connected to the rest of the world by 1985. If 1985 was the start of it all, then MGonz ran on the first Irish machine on the Net. I think Heanet's first connection to outside Ireland (to Janet in the UK) was after Ireland's connection to EARN (i.e. post-1985) but I am not sure of this. Why did Ireland get IE? Kieran Carrick of UCD registered the .ie domain in 1988. See post in May 1988, which also mentions Peter Flynn. A document I have says this came in on 1st Feb 1988. Definitely in use by Feb 1989. Kieran Carrick says IRLEARN was the first machine to use a .ie address. Its "Internet" address irlearn.ucd.ie co-existed with its older BITNET address. The irlearn.ucd.ie address was certainly in use by Feb 1989. MGonz ran on the first machine on .ie. I used the Internet in this period mainly by dialling-in to UCD from home. At this time, the Internet in Ireland was flat-rate - 11p for unlimited time on a local phone call. This was mainly because the telephone company Telecom Eireann didn't know it existed. Back in 1988 I was regularly making 10-15 hour phone calls to chat and email with people all over the world online and browse remote file archives. In 1993 Telecom Eireann changed local call pricing to a charge per 3 minutes, and the golden era was over. We used to have flat-rate Internet in Ireland. Then we lost it. Then we got it again with broadband. Chat programs existed on BITNET before 1985. e.g. We can see that Chat existed, but RELAY did not, as at early 1985. RELAY was invented in 1985, as this FAQ tells us, but incomprehensible history by its author (also here) is unable to. See RELAY network as at late 1985. IRC was written in 1988 with a similar structure to RELAY. It was basically RELAY for the "Internet" (the IP machines). I attached MGonz to BITNET using "MGonzNet" - my own version of the CHATDISC EXEC script. The original CHATDISC was by Eric Thomas, inventor of LISTSERV. CHATDISC allowed you have a customised "answer message" when you received a chat message when you weren't logged on. I rewrote the script to call a program at that point. Here we see some of the major figures in the origin of the Internet in Ireland - Dennis Jennings, Michael Walsh, Mike Norris, Niall O'Reilly and Kieran Carrick. "who" is a program that you run on the server (like a PHP script). "scoop" is a document download. "get" is a program download. "p" is a program that you run on the server (like a PHP script). Tim Berners-Lee's very first internal proposal for the Web was in March 1989. The first Web server in the world went public at CERN in Dec 1990. The first web page in the world was info.cern.ch in Dec 1990. The CERN WWW Virtual Library page dates from 1991. The first web site in Ireland was at UCC by Peter Flynn in 1991. The first web site in America (and the first web site outside Europe) was at Stanford in Dec 1991. The Mosaic Internet Starting Points page dated from 1993. Type "Google in 1998" into modern Google for some fun! beautiful Mosaic emulator so you can browse the modern Web with the first browsers. Early versions of major websites. Lovely: Someone manages to connect a 1984 IBM Portable to the 2009 Internet. 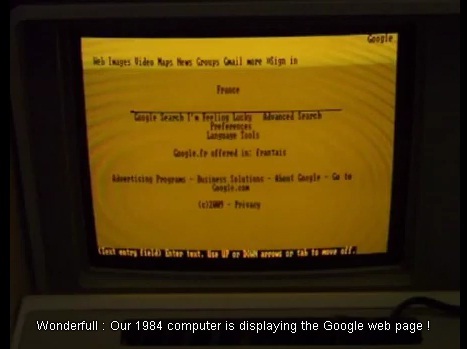 Here they are browsing 2009 Google on a 1984 machine. 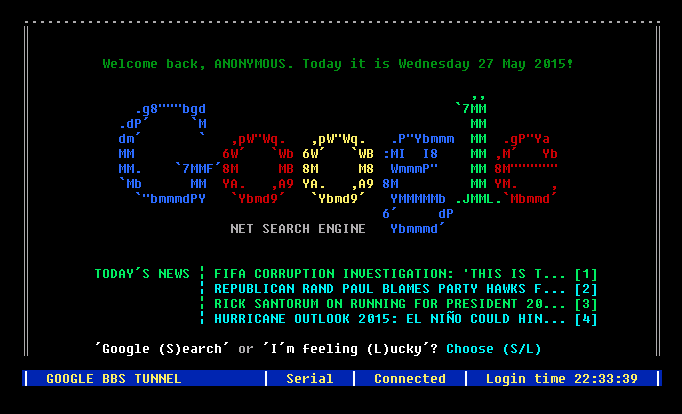 Genius: Someone designs a 1980s style front end for Google. It is actually live and works! The Design of a Real-Time Operating System for a Minicomputer, Parts 1 and 2, Dennis Jennings and Michael Purser, in Software Practice and Experience, 1975, 5, 147-167 and 1976, 6, 327-340. Systems Programming for Data Communications, Ahmed Patel and Michael Purser, Software Practice and Experience, 1980, 10, 283-305. The Performance of a Packet-switched Network - a Study of Euronet, Brian Alton, Ahmed Patel, Michael Purser and John Sheehan, in Proceedings of Performance of Data Comms. Systems and their Applications - Conference in Paris 1981 (Editor G. Pujolle), North Holland Publishers, Amsterdam. The Euronet Diane Network for Information Retrieval, Michael Purser, in Information Technology Research and Development (1982) 2, 197-216. Data Comms for Programmers (book), Michael Purser, 1986, Addison-Wesley. Paper by Kieran Carrick at EARN-88 conference. Return to How my program passed the Turing Test.